This in-depth comparison of simplemachines.org and vanillaforums.org might explain which of these two domains is more popular and has better web stats. 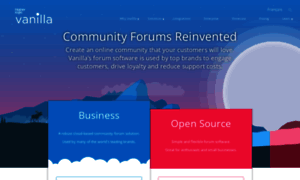 Comparing Simple Machines vs Vanilla Forums may also be of use if you are interested in such closely related search terms as vanilla forums vs simple machines and vanilla forums vs smf. Hoster Total Server Solutions L.L.C.